Fiona Stewart-Darling, Multifaith Chaplaincy in the Workplace: How Chaplains Can Support Organizations and their Employees. Jessica Kingsley Publishers, 2017. 176pp. 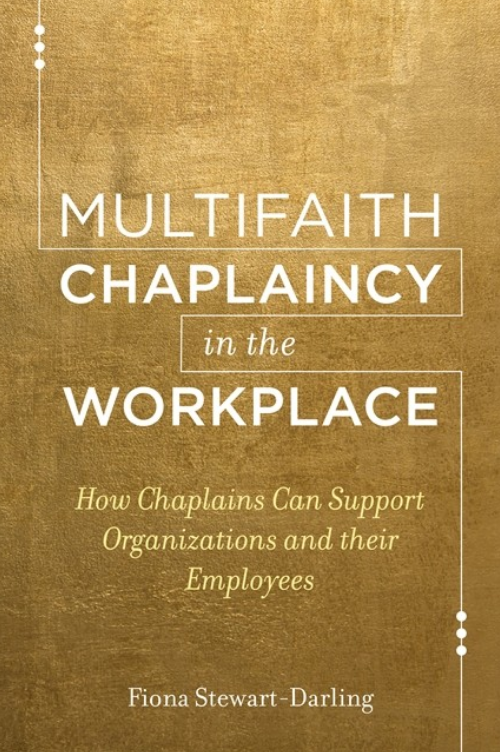 This book is a case study in building a workplace chaplaincy program. Fiona Stewart-Darling, an Anglican priest, explains the history and formation of the chaplaincy program she has led in the Canary Wharf district of London, UK. With her previous experience in higher education chaplaincy, she notes how the program began and the principles and practices that have allowed it to grow over the past decades. Though her chaplaincy was founded in this past generation, its structure is a successor to a series of what were called “industrial” chaplaincies in the post WWII-era in the UK and the United States. Canary Wharf is today one of the major business districts in London, containing the European headquarters of many major banks and professional service firms. It was reborn as a financial district in the 1980s, being built on the site of the former West India Docks, which in the early nineteenth century was one of the busiest port areas in the world but had steadily diminished until the docks were closed in 1980. Of interest to our readers, seafarers’ welfare ministries have been very active in the area since its beginnings and still have a presence in the Queen Victoria Seamen’s Rest a few blocks North of Canary Wharf on East India Dock Rd. As ships grew larger and port areas moved closer to the mouth of the Thames River, seafarers’ welfare chaplaincies have adapted, now focused on the Port of Tilbury to the East. The chaplaincy in Canary Wharf was encouraged by the original property developers, who had strong religious values. Paul Reichmann, the lead developer from the Canadian company Olympia & York, had trained as an Orthodox Jewish rabbi before he joined the family firm of property developers in the 1950s. The developers accepted a partnership with the Anglican Diocese of London to establish a multifaith chaplaincy for the growing business community. In 2004, Stewart-Darling set about establishing the chaplaincy, though not without challenges. The Canary Wharf group made clear that the chaplaincy was present as a guest, that it could not engage in proselytizing, and that it had to work towards becoming multifaith. The Anglican Diocese also made clear that the project had to be self-supporting within three years. The subsequent success of the program, both financially and in its mission, was in building relationships of trust, cultivation of community, and showing hospitality. Though many of those in the business world have the normal reaction to resist the overt presence of religion in their workspace, the chaplaincy found a space to serve with a listening ear and presence. It was actually in the time of the financial crisis of 2008 that the chaplaincy gained much strength. Stewart-Darling explains that “one of the unexpected consequences of this time was that my relationships within the banks and other companies based in Canary Wharf were strengthened, as I was prepared to just be alongside managers and employees, willing to listen and be there for them. Human resources managers became more willing to advertise the chaplaincy services for their employees. This in turn led to individuals at all levels within companies seeking me out to chat informally over a coffee or a glass of wine. They discussed their struggles, either work related or personal. For them it was helpful to chat with someone outside their normal everyday sphere who would listen, was impartial and non-judgemental” (30). The chaplaincy did need to navigate the issue of religious diversity and proselytism. The Canary Wharf developers stipulated multifaith service, but Stewart-Darling describes that though multifaith, this should not be interpreted as if the chaplains needed to be interfaith. That is, each chaplain–Jewish, Muslim, and several from different Christian denominations–was not called on to be a specialist of all religions or interpret the other’s religion, but called on to speak from their own tradition. Her opinion is that she has been allowed to speak much more from the essence of her own tradition specifically because she is not forced to be a one-size-fits-all chaplain for all religious groups. An important exploration in the book is to show how her work represents her Christian tradition while steering clear of proselytism. She speaks of her work as a ministry of presence, but especially says that a chaplaincy that wants to avoid the label of proselytism can be characterized by building community and showing hospitality. Interestingly, she writes that these same values of community and hospitality are often the substance of conversations she has with those she serves when discussing the complexities of the marketplace and business ethics. The book is a quick read and might have a number of lessons for those serving in maritime ministry. In many ways, the pressures of serving as chaplains in port environments are similar to those of workplace chaplains. If nothing else, it is encouraging to read of a chaplaincy that has grown up on the same soil where maritime ministry once served.